The process of plasma ashing, plasma stripping or micro-incineration is usually restricted to the total removal of organic matter by an oxygen plasma; the products being carbon oxides and water vapor, which are volatile and pumped away by the vacuum system. Historically, the first application was for the removal of photoresist in the microelectronics industry. Photoresist is composed of organic compounds, essentially consisting of carbon, plus hydrogen and oxygen. Exposure to an oxygen plasma eventually removes all the photoresist as volatiles leaving no residues, unless there are inorganic contaminants in the photoresist. The shows process is therefore totally dry and is also a means of concentrating inorganic contaminants in organic materials. This is a major application for RF plasma systems. The exact protocols vary from country to country, but in the UK the following is a summary of the recommended method. The technique requires that a specimen of filtered air (or water) is collected from a known volume on MF series filter (mixed cellulose acetate and nitrate). The filter is then transferred to a microscope slide, treated with a clearing solution, dried and then transferred to the plasma unit. The asbestos fibers are then exposed by partial ashing of the filter by treatment in an oxygen plasma for typically seven minutes. This removes surface layers of the filter, leaving the asbestos fibres exposed but still attached to the collapsed filter matrix. The fibers can be counted and identified by light microscopy, light contrast microscopy, SEM and EDX. Some SEM and EDX protocols require complete ashing of the filter. Small specimens can be ground and distributed in a petri dish to produce maximum surface area. The coal dust can be ashed by an oxygen (or air) plasma at low temperatures, compared to the extremely high temperatures generally used in a muffle furnace for this process. Volatile elements, such as selenium, are retained and therefore a more accurate calorific and ash value can be produced. Problems in estimating the required values are a result of the structure of coal which includes organic materials (and hence convertible material) together with inert inorganic materials in the same overall matrix. Plasma chemistry is a surface reaction, so methods such as the ashing of coal require the exposure of new surfaces. For this reason physical stirring of the specimen is recommended every 1-2 hours. The complete ashing of a 1g specimen is typically completed in 12-24 hours. The EMS 1050 can be used to remove the organic content from coal, leaving a residue of mineral and volatile components for subsequent analysis. The advantage of low temperature RF plasma ashing over other methods, such as heating in a muffle furnace (typically at 700°C), is that many more of the volatile components are retained. In the following experiment oxygen gas was used with a forward power setting of 100W. A thermocouple was introduced into the chamber via a vacuum feed through in the rear of the EMS 1050 process chamber. The thermocouple was fixed with high temperature resistant tape to the base of a glass Petri dish and covered with approximately 5g of coal granules of approximately 1-2mm3 in size, covering the thermocouple tip to a depth of 1.5mm. After one hour it was apparent that the temperature had reached a maximum 150°C. Plasma ashing as a pre-treatment for atomic absorption analysis (AAS) is another well-established application. In this case one is normally looking for metals such as lead, cadmium, zinc and mercury in trace quantities in organic materials such as vegetables, dairy products or animal tissue. A specific example involves the treatment of multiple specimens of human blood exposed to a CF4/02 plasma. The organic materials in this application can be removed in 15 minutes, leaving only the metallic contaminants to be analyzed for cadmium. 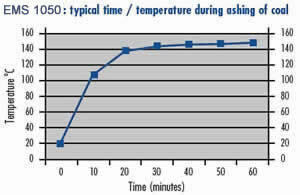 Plasma ashing has also been successfully used to ash materials as varied as post-mortem lung tissue (for asbestos), bread (to determine type and distribution or iron) and specimens of prepared food (for asbestos and man made mineral fibers). Specimens need to be dried prior to ashing and their size kept to a minimum. Similar problems are encountered in composite materials such as paints, vehicle tires and brake linings, contaminated oils and the application of clays onto paper. In paints, the organic binder can be removed to leave the inorganic pigment in its original distribution. In paper, the clay platelet distribution and adhesion can be investigated after ashing of the paper and binder. Similarly, epoxy composite materials can be investigated. These two SEM micrographs show before and after results comparing identical areas of a metal photo litho plate on which extraneous lines can be visualised. Treatment in a barrel plasma reactor, with oxygen as the process gas, removed the ink - which is essentially a carbon pigment in a binder - without disturbing anything that was present underneath. Subsequent SEM examination shows a scattering of particulate material made up of irregular platelets 0.2 to 2µ in diameter. X-ray microanalysis gave a spectrum characteristic of a clay mineral. Plasma ashing and plasma etching rely on the same basic principles. Plasma Etching is usually confined to the semiconductor industry, and more often than not, uses carbon tetrafluoride (with oxygen) as the plasma process gas. Probably the most frequent application is the etching of silicon, silicon oxides, and silicon nitrate, as well as glass passivation layers. Failure analysis of integrated circuits is also an important application of plasma processing. Oxygen gas is used to remove epoxy encapsulates, CF4/02 is also used to remove glass filters in the encapsulants and so uncover devices which have failed. Inspection by methods, such as SEM, is then possible. When etching, it should always be remembered that not only the required surface will be removed. Careful choice of gas is made so that preferential etching of the required surface is attained. Plasma etching is a chemical process. The RF discharge generates species which then react with the material being etched to form a volatile product. The resulting products are swept away by the gas flow. Since reactive species are being formed, the reactant gas is chosen to give the highest concentration of the etching species. For example, CF4 and CF4/02 mixtures produce very reactive fluorine and CF3 radicals and ions. Similarly, other gases and volatile compounds have been investigated and used to etch a wide variety of materials. These include CCl4, CFCl3, C2Cl6, C2F6, SF6, SIF4, and mixtures of these gases with H2, O2, Ar, He, CO2, CO, N2 etc. This SEM micrograph shows a set of free-standing single crystal silicon wires for studying thermal transport. The wires were fabricated in silicon-on-insulator material using electron beam lithography and CF4 plasma etching in a barrel reactor. The wires are 40µ long, 1µ wide and 0.5µ thick and are suspended above a silicon substrate. A number of applications of plasma involve the surface treatment of plastic materials, prior to a subsequent process. An example is the treatment of reinforcing fibres that are to be integrated into an epoxy structure. Treatment in an oxygen plasma for say, five minutes at 50-100W, increases surface roughness. These pitted fibers enhance adhesion and a good mechanical bond is produced with enhanced rigidity and strength. Plasma processing of plastics can also convert a hydrophobic surface to a hydrophilic surface. This type of treatment usually requires short exposure (3-5 minutes) at low power (50 watts). This sort of reaction has been applied to the assembly of ink pens to improve the speed of ink filling and transfer. Other examples include the treatment of electrical wiring so that the insulation can be printed upon with regular inks. Plasma treatment of car bumpers allows simpler and more cost-effective painting schedules and the treatment of textile fibers can improve water retention. Plasma surface treatment in biomedical applications is expanding rapidly. For example, surface modifications of a polymer to improve blood compatibility. This involves tailoring the polymer surface to minimize blood reaction. Similarly, the internal surfaces of tubing can be modified, allowing pharmaceutical materials to be chemically bonded to the surfaces, thus allowing the drug to be slowly dispensed in a localized area. Plasma polymerization refers to the polymerization of active species generated in a plasma. For example, the introduction of polysiloxanes onto hard contact lenses improves the hydrophilic nature of the surface. An application in the soft drinks industry using CF4, to create a fluorinated surface on PET and polypropylene bottles, making bottles less pervious to carbon dioxide. A porous surface can be produced on medical equipment, this makes it possible to sterilise the equipment with nitrous oxide while remaining impervious to air. Deposition of polymers onto the surfaces of implants is also possible and can help prevent rejection by improved bio-compatibility. An important application of plasma technique is to improve the ‘wettability’ and adhesion of polymers for surface coatings, inks and dyes (1). Self-adhesion can also be markedly improved by plasma treatment (2, 3). Plasma techniques are widely used in the electronics industry (4) particularly for microelectronics fabrication. Although most of the materials involved in these applications are inorganic, they are of interest to polymer chemists because polymers can be use as resists, insulators or semiconductors. Operations carried out by plasma techniques include photoresist removal (5), etching silicon compounds (6) and deposition of polymer films (7, 8). The chief virtue of plasma techniques in microelectronics fabrication is that it permits automated, multi-step processing of complex devices (9). Applications for plasma polymerization have included the production of protective coatings for metals and other reactive surfaces (12), fabrication of reverseosmosis membranes (13), coatings for optical plastics (14) and the formation of radiation resistant coatings (15). Last and by no means least, is the application of plasma ashing for the analysis of inorganic materials within an organic matrix. Prime examples include the investigation of asbestos fibers in air and investigation of metal contamination of food. 1. M. Hudis, Techniques and applications of plasma chemistry, Wiley-Interscience, New York, 1974 chap. 3. 4. R. W. Kirk, as (1) chap. 9. 5. S. M. Irving, Kodak Photoresist Seminar, 2, 26, (1968). 6. H. Abe, Y. Sonobe, and T. Enomoto, Jpn. J. Appl. Phys., 12, 154 (1973). 8. A. Chida, Jpn. Kokai Tokkyo Koho, 78,47, 393, (1978). 9. R. L. Bersin, Kodak Microelectronics seminar proc., San Diego, Calif., October 1-3 (1978). 10. P. Kassenbeck, Bull. Inst. Text, FR. 18, 7 (1963). 11. W. J. Tjhorsen, Text. Res J 38,644, (1968). 12. T. Williams J, Oil Colour Chem Assoc., 48,936 (1965). 13. H. Yasuda, Appl., Polym. Symp., 22,241 (1979). 14.1. R. M. Kubacki, US Patent 4096315 (1978). 14.2. Y. Masuda and Y. Nakagawa JPN, Kokai Tokkyo Koho 78, 56, 177, (1978). 15. M. Miyamura, JPN, Kokai Tokkyo Koho, 78, 120, 527 (1878). EMS 1050 Plasma Ashers are available online from the EMS Catalog. For ordering or product information, click here.